Experience what the Northern Rivers and the Byron Shire has to offer by enjoying some of the most spectacular walking trails in the region. Wander through lush rain forests or take the coastal tracks to some of Byron Bay’s most tucked away beaches. Make the time to slow down, relax and take in where you are. One of Byron Bays most iconic walks. 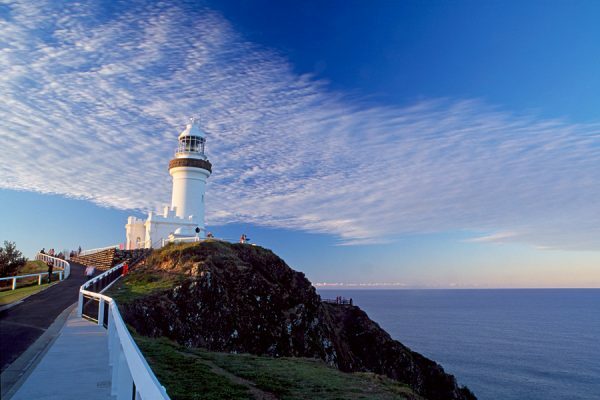 The spectacular coastal track to the Byron Bay lighthouse is a must do when visiting Byron Bay. You can see as far as the horizon and watch whales, dolphins and turtles in the bay bellow. The waterfall flows over 100 meters off the cliffs and is a breathtaking sight from the lookout at the top. You can also take the incredible 13km walk to the bottom of Minyon Falls. The walk leads you through the rain forest of the Nightcap National Park. Make the time to walk through the Broken Head Nature Reserve. Experience the Aboriginal culture, whale watching and enjoy Broken Heads pristine beaches. Rocky Creek Dam offers four different walks all equally as enjoyable. The walks will take you through, bush. rain forest and around the creeks and dam. The walks vary from 20 mins to 1.5 hrs. They include the Platypus walk, Water Dragon walk, Cedar walk and the Scrub Turkey walk. The Protester Falls walk is one of the greatest walks in Australia. It is an easy walk of 1.2km through rain forest and Bungalow palms to the base of the falls. Did you know Victoria’s offers picnic hampers for you to take on your daily outings. Bring along a healthy lunch which includes wraps, salads, quiche, cheese and crackers and a little something sweet. Just ask our lovely staff.